Are you currently in favour of proportional representation? 4:30 PM on December 7, 2018. Countdown to the Referendum - Voting Period October 22 - December 7, 2018 4:30 P.M. Please note, to drop off a voting package in Burnaby, Surrey or Vancouver, visit a Referendum Service Office (not a Service BC Centre). The Social Development and Poverty Reduction office in Masset is not providing any referendum services. Locations with a 24-hour drop box are indicated in the location column in the Link above. Your completed package is considered received by Elections BC when delivered to a Service BC Centre or Referendum Service Office. Not a Registered Voter in BC or need to update your voter information? This is a non-partisan guide created by Okanagan College Library and Political Science Department for anyone interested in learning more about the proposed BC-wide electoral reform in 2018. 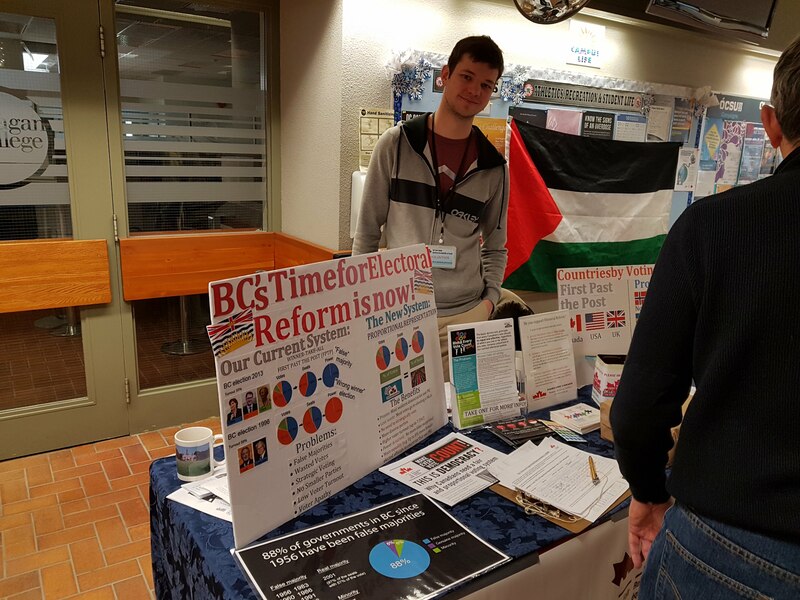 Okanagan College has no opinion on the issue of electoral reform or the government’s referendum, and this guide is intended for educational and information purposes only. The BC Government has launched the website "How We Vote" to provide information on the referendum and electoral reform and to "invite British Columbian to provide input to help shape the fall 2018 referendum on electoral reform." The online questionnaire was closed on February 28, and a report with 18 recommendations to Cabinet for the referendum was released on May 30th, 2018. You can read the report on their website or directly here. The NDP government has introduced legislation to hold a province-wide referendum in 2018 on electoral reform. What: The referendum will ask the voters to decide if they want to change the current electoral system from the 'first-past-the-post' voting system to a form of "proportional representation". How: Registered Voters will receive a ballot for the referendum by mail. Is the Referendum Binding: The referendum is binding if more than 50% of the validly cast ballots. Are in favour of the same voting system, if a question has the option of more than 2 answers. This means that if the majority of votes support First Past the Post on Question 1, the voting system will stay the same. If the majority of votes support proportional representation on Question 1, the voting system with the most support on Question 2 will be adopted. This means that if the majority of votes support First Past the Post on Question 1, the voting system will stay the same. How will the second question be counted: Voters rank the proportional voting systems on the second question in order of preference. If a voting system has more than half the first preferences, that system has the most support and no further counting is needed. Otherwise, a second round of counting is required. In the second round, the system with the least amount of support is eliminated. The second preferences of the voters who had the eliminated system as their first preference will be transferred to the remaining two systems. Whichever system has the most votes after the second round of counting will be the system with the most support. 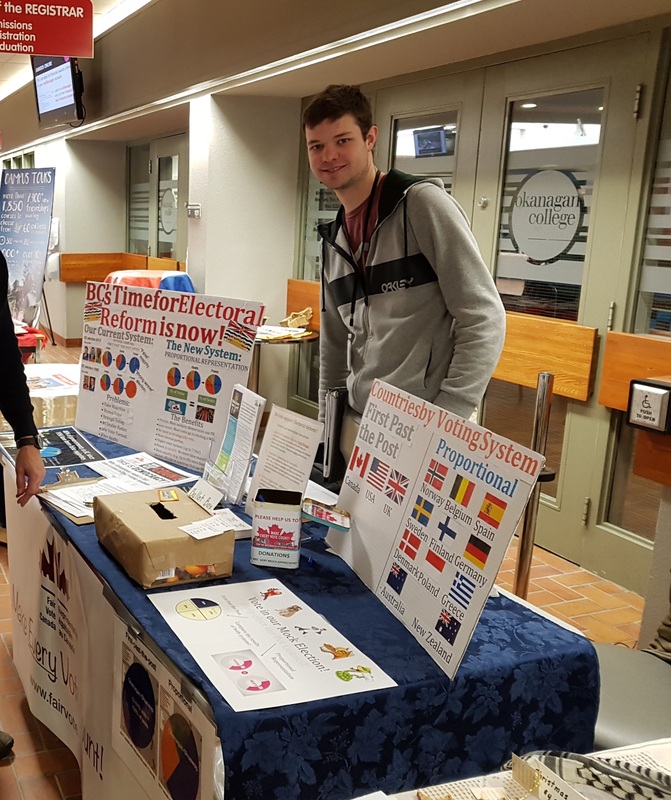 Okanagan College hosted the annual World Community Film Festival at our Kelowna Campus earlier this month, and Fair Vote Canada had a table at the festival to disseminate information about the upcoming BC referendum on electoral reform and advocate their cause. Here are some images from the event.